Hannah Fetterman joined Summit in the Fall of 2016. Prior to joining Summit, Hannah worked for Financial Solutions, LLC and The Walt Disney Company. 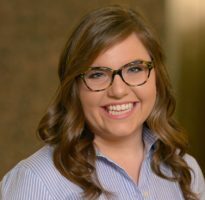 In the Spring of 2016, Hannah graduated from The Ohio State University with a Bachelor of Science degree in Consumer and Family Financial Services. During her time at Ohio State, Hannah served as the co-president of the Student Financial Planning Association. Hannah became a CERTIFIED FINANCIAL PLANNER™ professional in 2018 and is a member of the National Association of Personal Financial Advisors (NAPFA). Hannah is from Pickerington, Ohio and enjoys traveling, scuba diving, cheering on the Buckeyes, and spending time with family and friends.